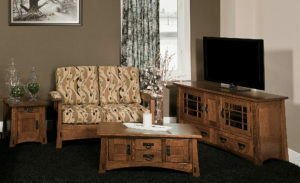 Looking for a living room set that’s comfortable, superbly constructed and reflects your status? 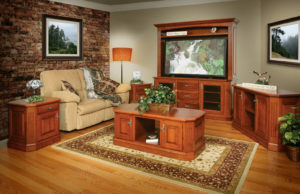 Then you need to check out the collection of living room sets below from Brandenberry. Amish craftsmen build them all. And that’s your assurance of impeccable quality, comfort and long life. A regal style describes the Buckingham Living Room Set. 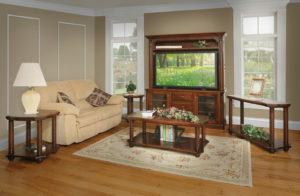 The Lexington Living Room Set features richly elegant construction. Presenting a collection of expertly handcrafted, custom-made living room furniture sets from Brandenberry Amish Furniture. Skilled Amish cabinetmakers custom-build each piece. And they use solid hardwoods like oak, cherry, maple and hickory. So, with proper care, the living room set you choose should become a family heirloom. You’ll find a variety of styles within the collection. Including traditional living room sets. So finding the ‘perfect’ set for your home should be easy. And fun! Also, notice that in some sets, the sofa is padded throughout. While others leave fully or partially exposed wooden arms. All pieces are fully customizable. For example, you can choose the wood specie and hardware. Plus the stain, paint and finish. Also, you can select from a wide array of styles and designs.